Lol, funny. I wonder how far this’ll go. This is already beginning to get old. Only worth it if you do something uniquely, darkly, and cynically funny alongside. I actually went to high school with that kid. He never graduated but went into Real Estate and now is a millionaire. He is the top Realty agent in upstate NY and he is only 23 or 24 years old. Oh, and he is gay, so mAgnUS was right on. 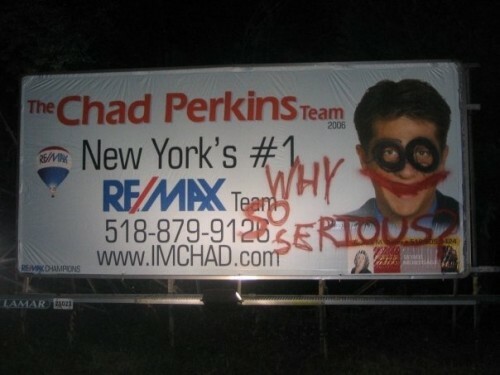 I need to find out where this billboard is because I want to drive by it. And giggle.